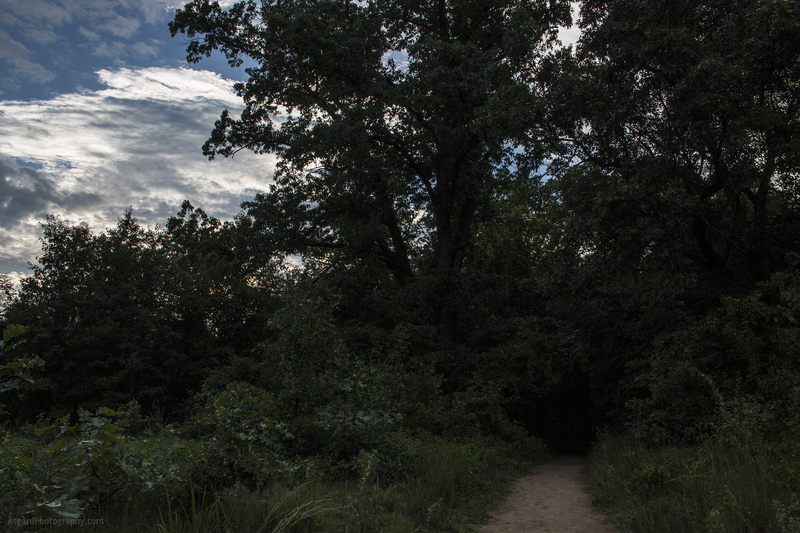 As awesome as trails through woods are, there’s just something about trails through darkened woods after sunset that make you think twice before going in. Most often when I’ve visited Wildwood Park it’s been overflowing with people (it’s a popular “nature” spot for Toledo and the surrounding area) but it helps if you go during an off time. In this case it was pretty much me and the mosquitoes. And whatever might be lurking in the dark! I actually like walking at night, but only through residential areas for the most part. Pictures like this are tricky, because with part of the scene much brighter than the rest, it’s difficult to get the right settings. You tend to end up with a higher ISO and lots of noise, to make a grainier shot. So you end up having to tweak things in Photoshop more.